Since 1989, Pro One Janitorial, Inc.'s franchisees provide top-notch cleaning services to customers in various industries. All our franchisees are well-trained independent business owners who strive hard to deliver the desired results. We help all small, medium and large businesses to save their money and time by being top choice for all their cleaning needs. All our services are cost-effective and efficient which best suit your unique needs. 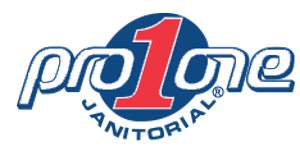 From housekeeping to hard floor and carpet care services, Pro One's franchisees cover it all. We take pride in our franchise system which consists of professionally trained independent business owners who are committed to providing exceptional customer service. We work closely with our clients, which helps us to provide dependable cleaning services and ensure complete customer satisfaction. Pro One provides training and marketing assistance to all our franchisees and guarantees a minimum amount of businesses monthly. Ongoing consultative services available to our franchisees ensure a long-lasting relationship with our customers.